^ 1.0 1.1 Griffiths AJ, Miller JH, Suzuki DT. 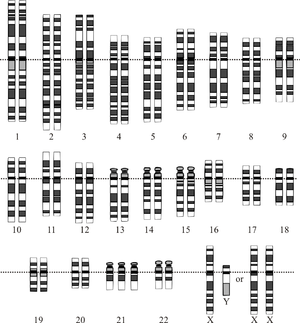 An Introduction to Genetic Analysis 7. 2000: Chaper 18. ^ Sen S. Aneuploidy and cancer. Current Opinion in Oncology. January 2000, 12 (1): 82–8. PMID 10687734. doi:10.1097/00001622-200001000-00014. ^ Driscoll DA, Gross S. Clinical practice. Prenatal screening for aneuploidy. The New England Journal of Medicine. June 2009, 360 (24): 2556–62. PMID 19516035. doi:10.1056/NEJMcp0900134.